Specific molecules or cells are often captured using the super-paramagnetic properties of functionalized magnetic beads. This technology, which is both used in molecule isolation and IVD reagents, needs the magnetic beads to be coated with a target-specific ligand. The process used to achieve this is the coating of magnetic beads. 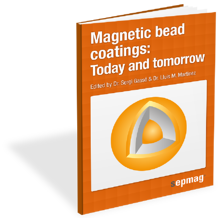 This ebook intends to summarize the current approaches for magnetic bead coating, as well as the new arising technological solutions that will help to surpass the current technical challenges.